The Arena Salix pavillion is a graceful structure built with natural willow rather than steel. In the Arena Salix, the natural replaces the manmade – supple young willow branches supplant concrete and steel, marking a clear balance between natural and artificial architecture. In many ways, the work is a critique of architecture’s ecological and sustainable footprint. The projects demonstrate the simplicity with which architecture can be ecological and thus, become spokespersons of sustainability. Ecological relationships are addressed not only through materiality, but also at several crucial scales. Through the choice of material – willow branches, the architecture becomes landscape itself, and waste materials both during and after construction are eliminated. The projects are community based - usually built by locals - volunteers, school children, helping build local landmarks, nourish community identity, and raise a respect for the environment. The success of these aims are seen in the popularity and fame of the projects, within the community, post construction. As the diagrams of Arena Salix projected evolution depict, the projects are living projects. The Arena Salix is thus a responsive architecture, changing with natural climatic cycles, turning from green and lush to bare and minimal, architecture based on emergent systems minus the software and advanced scripting languages. As the branches of the pavilion take root and grow, they mutate the structure and transform the architecture. Parametric design and self-regulating systems, thus achieved with a simplistic gesture. Right-thinking Jack Vance fans will be transported back to the first time they read The Houses of Iszm, the 1954 Jack Vance classic. 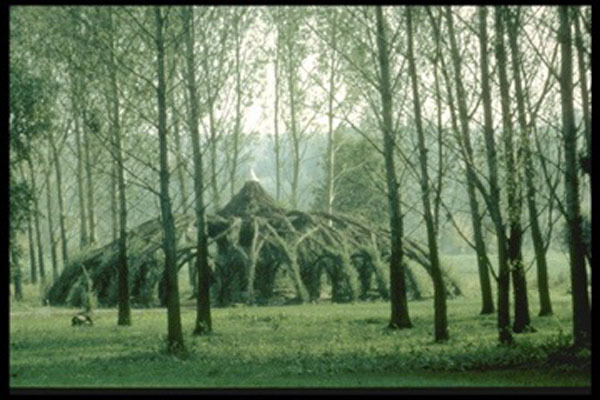 The Iszic expended their cultural energies creating amazing house trees that were famous throughout all civilized worlds. From sanfte struckturen via MAKE.